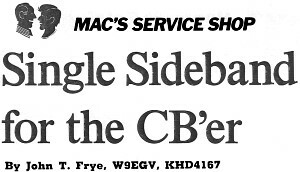 If you need a little brushing up on your basic single sideband (SSB) operational theory versus straight amplitude modulation (AM), then let this dissertation by Mac to Barney be it. There are no circuit details, just talk about how power from the carrier and dual sidebands is reallocated to a single sideband, thereby improving efficiency. I like the 'dried milk' analogy Mac uses in reference to SSB being transmitted sans carrier (i.e., water), with the receiver being responsible for reintroducing the carrier in order to demodulate the signal. Although I cannot personally comment as to its validity, many people familiar with comparing DSB AM to SSB AM say there is a certain je ne sais quoi that is missing in the tonal quality of SSB. "Mac," Barney said to his employer working at the bench beside him, "I want to ask you about the olden days." "Do tell, Sonny," Mac answered, laying aside the diddle stick he was using to adjust a sound trap on the color chassis in front of him and affecting the cracked falsetto voice of old age; "how come and how 'olden'?" "While I was eating at Burger Chef this noon, a young guy with a whip on his car noticed my ham call license plates and pulled up beside me and began peppering me with questions about the relative merits of single sideband as compared to amplitude modulation. He was an avid CB'er and was thinking of going SSB." "Well, you should have been a gusher of information. After all, you're yakking it up on SSB all the time." "That's just the point. Hams had already switched to SSB when I got my ticket. I've never operated anything but SSB and a little FM on two meters. On the bands I work, you hear very few AM stations. I felt like the man who, when asked how his wife was, answered 'Compared to what?'" "Did you confess you didn't know?" "Are you kidding? A ham never admits ignorance to a CB'er. I told him I had to get back to work but that I'd see him at the same place tomorrow and give him the scoop. I knew you have been an avid shortwave listener ever since you heard Marconi send his first message, and I figured you could fill me in." "Thanks a bunch! But aren't you taking a chance in asking a senile old man for information? It just so happens, though, that I was listening during the time the big changeover from AM to SSB occurred on the ham bands, and I heard the pro and con of both systems debated heatedly over and over again. I will not be surprised if CB follows along much the same pattern in the next few years." "I gather AM didn't give up easily." "You gather correctly. 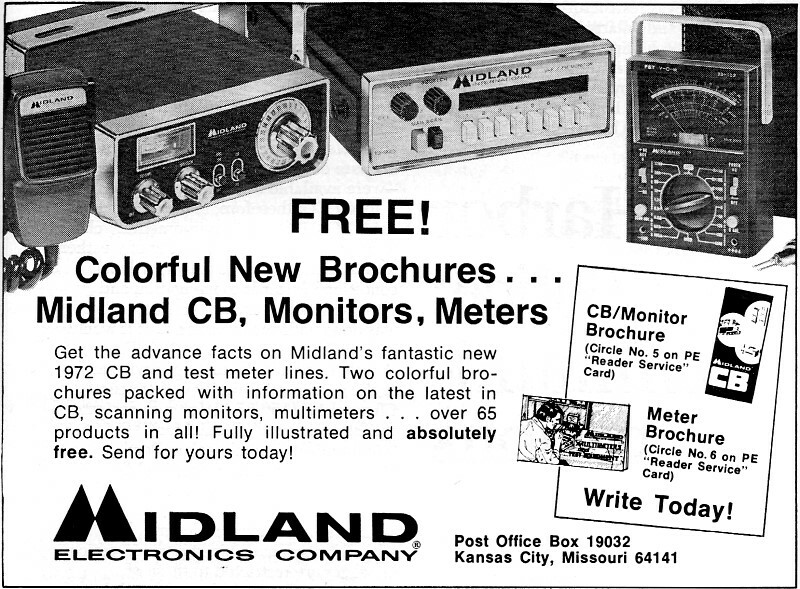 There was a great deal of bitterness and name calling when the first few SSB stations came on the air. AM operators sneeringly referred to the new signals as 'Donald Duck' and 'slop bucket' modulation. The SSB boys retaliated with scornful references to 'Ancient Modulation.' Each group accused the other of putting out broad, interfering signals, and 'each group" deliberately interfered with the other. "Then the two types of modulation aren't very compatible." Advantages of SSB. "Not very - at least not on the ham bands when you're receiving unwanted SSB signals on an AM receiver, and vice versa. But before we go into the "why" of that, let's talk about the claimed advantages of single sideband. The first is talk power, and this adds up to a whopping 9 dB. Here's how. "A very efficient 5-watt AM-CB transceiver might produce a 4-watt carrier without modulation. On a panoramic receiver which displays r-f voltage on the vertical axis of a scope tube and frequency on the horizontal axis, this carrier would be a single vertical line rising from the base line at the carrier frequency. We can adjust this line to a convenient one-unit length with the receiver controls. Now if we modulate this carrier 100% with a 1000-Hz sine wave, we see two other vertical lines, each 1/2 unit in length, spring up on either side of the carrier signal at a distance of 1 kHz from it. The carrier line remains unchanged. However, if we simultaneously examine the modulated envelope of our signal, we find modulating the carrier 100% caused the peak envelope voltage to double on positive peaks and to fall to zero on negative peaks. "Our peak voltage is now 2 units, and since the power across the fixed antenna resistance is equal to the square of the voltage, the peak modulated power is 2 x 2 or four times the unmodulated carrier power: 4 x 4 or 16 watts. The final stage and power supply must be able to deliver this amount of power. "The question is: how much of this 16 watts is actually talk power. Since the only change we saw under 100% modulation was the appearance of the sidebands-the carrier amplitude did not change at all - the talk power must be in these. Each sideband was 1/2 unit high. That means each contained (1/2)2 or 1/4 the carrier power or 1 watt. Their total was 2 watts. "Inasmuch as the carrier contributes nothing to the intelligence of the signal and the sidebands do not actually need anything to 'carry' them through the air, suppose we eliminate the carrier and divide the power it wasted between the two sidebands. When half the cannibalized carrier voltage is added to each sideband, each becomes one unit in length and their total power becomes twice the original carrier power, or 8 watts. We now have a double-sideband-suppressed-carrier signal with four times the talk power of the AM signal. "But hold on! The two sidebands are as identical as the two faces of the god Janus. They repeat, in unison, the same message. So why not eliminate one and use the power saved to amplify the other? When we pick up one sideband and stack it on top of the other, this lone voltage grows to two units in length. That means the power of this single sideband is (2)2 x 4 or 16 watts, and it is all talk power. The two watts of talk power of the AM signal has increased eight times, or 9 dB, with the same power consumption." "Hey, how about that!" Barney exclaimed. "That's not all. Remember each sideband is separated from the carrier by a distance equal to its frequency. The width of an AM signal, therefore, is twice the highest modulating frequency. Voice modulation with frequencies up to 3,000 Hz means a 6-kHz wide signal. But SSB, transmitting only one sideband, occupies only half this bandwidth. Two SSB signals fit neatly into the 6 kHz taken up by a single AM signal." What About the Carrier? "If we don't need the carrier, why did we get tangled up with it in the first place?" Barney asked. "I never said we didn't need it. I said we didn't have to transmit it. We need the carrier for a reference at the receiver to recover the modulating frequencies. You recall a 3000-Hz modulating frequency was converted into a radiated r-f frequency removed from the carrier by ±3 kHz. Similarly all transmitted sideband components are keyed to the original carrier frequency; that is, the frequency difference between anyone of them and the carrier indicates the audio frequency producing that particular component. Therefore we must have either the original carrier at the receiver or another carrier of exactly the same frequency. An AM transmitter simply sends along the original carrier. SSB utilizes the 'dried milk' technique: all the water is taken out for shipping and then is replaced by the consumer to reconstitute the original. In the same way the product detector of the SSB receiver produces a carrier that can be inserted into the incoming sideband signal precisely where the original carrier was. Difference beats between the components and this carrier reproduce the original modulating frequencies." " 'Precisely' is the right word," Barney offered. "If that inserted carrier is off more than 50 Hz from the point the original carrier occupied in the signal, voices do not sound right-and that means maintaining a frequency error of less than two-parts-per-million at 27 MHz. Tuning errors you'd never notice on AM render SSB unintelligible. 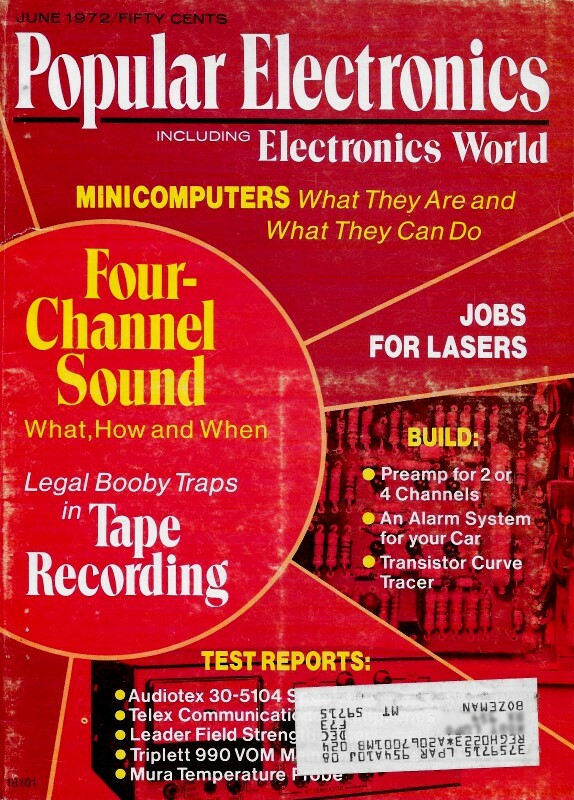 However, since both transmitter and receiver on CB are crystal controlled, I assume this presents no problem." "Don't be too sure," Mac warned. "From the heterodynes I hear on a CB channel when skip is coming in, it's evident that not all transmitters on the channel are on the same frequency. CB crystals must be within 0.005% of the specified channel frequency, but that means a permissible error of 1350 Hz at 27 MHz. A transmitter operating at one end of this error limit and a receiver at the other would be 2.7 kHz apart. Some form of fine tuning is obviously a must for the receiver portion of a SSB CB transceiver." "Since a SSB signal is only half as wide as an AM signal, why does it seem wider to AM operators?" "Because of the AM receiver's slower attack type of avc and the wider passband. The powerful pulsing type of signal from a SSB station overloads the front end of these receivers that run at full r-f gain on weak signals. Reducing r-f gain and using a beat frequency oscillator to insert a carrier makes it possible to receive SSB on an AM receiver and gives a much more realistic idea of signal bandwidth." "Don't forget an AM carrier puts a nasty heterodyne into a SSB receiver unless that carrier is exactly zero beat with the SSB station," Barney pointed out. "No wonder the two get along like cats and dogs. But SSB, with eight times the talk power and taking up only half as much room, has a lot going for it." "There's more. With stages in the SSB transmitter operating in a linear fashion, there is less distortion to produce TVI causing harmonics. That does not mean, I hasten to add, that SSB can't cause TVI by front-end overload of the TV receiver. Also, the only time a SSB transmitter consumes appreciable power is when it is actually being modulated. There is no carrier to waste a high percentage of full-modulation power while you're thinking. These make possible the use of smaller output tubes and lighter power supplies. And there are no high-power audio amplifiers. You never saw any table-top kilowatts until SSB came along. Finally, push-to-talk with full break-in is a natural with the SSB mode of operation." Any Drawbacks? "Doesn't SSB have any drawbacks? Why hasn't it caught on faster on CB?" "It has drawbacks. I've already mentioned the much more stringent frequency stability requirements. Circuitry in both transmitter and receiver is more involved. These things add to the expense. But the hobby type of operation of most CB operators is the greatest deterrent. They don't want to talk just to their own units; they want to talk to other CB stations, most of whom can't receive SSB. 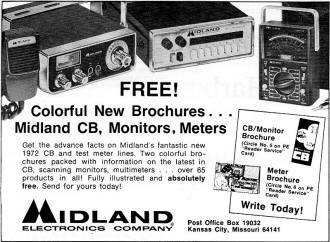 A SSB station on CB at present is like a frog sending out a mating call in the desert: he doesn't get many answers! Other stations can't understand his Donald Duck squawking. That's the way it was on ham radio at first, but once hams grasped the advantages of single sideband, that mode of operation snowballed."